This well presented 3 bedroom semi-detached property in Konia is situated on a small project. There are 6 other properties in the complex and it’s in a quiet residential area. The property is spacious throughout with good quality finishes. The ground floor features a guest cloakroom, large separate kitchen/diner and open plan living room with comfortable lounge and dining area. A built-in cupboard under the stairs provides useful additional storage space. The kitchen has plenty of fitted cupboards and worktop space. Appliances include a built-in oven, gas hob, extractor fan, fridge/freezer, washing machine and there is also space for a dishwasher. From here there is direct access to the private rear garden. A marble staircase with wrought iron balastrade leads up to the first floor accommodation. The master bedroom has an en-suite bathroom, two double size bedrooms and a family size bathroom. 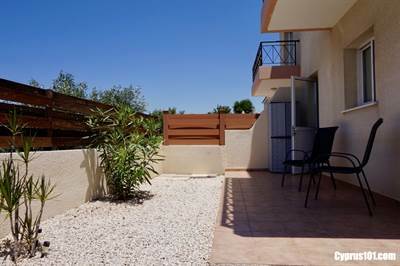 All bedrooms have fitted wardrobes and the master and second bedroom have private balconies with sea and rural views. The property has a sizeable L-shaped outdoor leisure space. There is a rear patio off the kitchen and a second patio to the front of the property. There is plenty of space for relaxing and outdoor dining and the garden is designed with low maintenance in mind. To the side of the property is a gated driveway where you can easily park two cars and there is further on-street parking if required. If you fancy a cool dip, then at the far end of the complex is the communal swimming pool which is well maintained and cared for by the residents. The spacious size and design certainly makes this property suitable as both a permanent residence or a lock up and go holiday home. It comes fully furnished and has full title deeds.